To provide comprehensive one-stop Marine Engineering Solutions to surpass the expectations and to suit the needs of the clients in a safe and sustainable manner. To be the Marine Engineering Solutions provider of Choice in Singapore and the region by building everlasting partnership with our clients through consistently providing best solutions. Professionalism All our Team Members are trained and regularly updated with the Industries’ needs, which will aid them to provide adequate and real time solutions for our clients. Quality Constant updates and training provided to our Team Members will ensure the Quality is always achieved with the highest of standards. Responsibility We pride ourselves with the standards set and achieved, we undertake to provide a cost effective solution whilst not compromising on Safety and Quality. 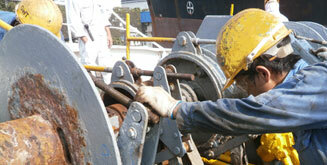 Reliability We strive to provide a team of professionals with professionalism and unparalleled dedication. © 2014 - 2019 mrmmarines.com All Rights Reserved.